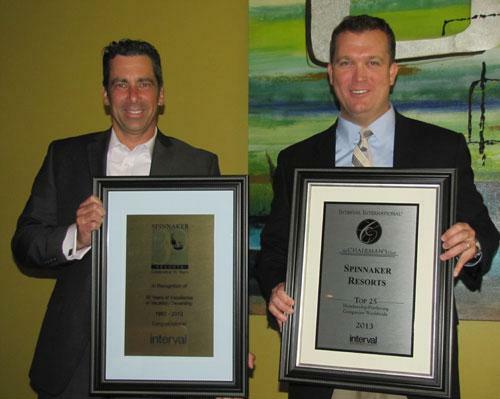 Spinnaker’s resorts have been recognized by its exchange affiliation partners II (Interval International) and RCI (Resorts Condominium International) with Premier and Gold Crown designations respectively. 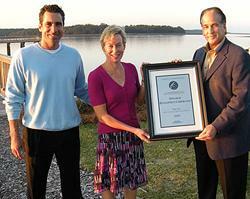 Spinnaker was first inducted into II’s Chairman’s Club in 2008—awarded to the Top 25 Sales Producing Resorts Worldwide. Spinnaker achieved this award again in 2009 through to 2018—11 years in a row. Shawn Oliver, Executive Director Sales and Marketing, of Resort Sales, accepts a commemorative Anniversary Plaque on behalf of Spinnaker Resorts, in recognition of Spinnaker’s 30 Years of Excellence in Vacation Ownership (1983-2013) from Interval International’s Senior Vice President Bryan Ten Broek. In 2009 Mr. Craig Nash, Chairman-Chief Executive Officer of II made his first visit to Hilton Head Island, SC to conduct site visits at all of Spinnaker’s HHI Resorts and host an appreciation event for Spinnaker at Bluewater. Hilton Head is one of the first markets in North America to offer timeshare ownership. While touring Bluewater Resort and Marina, Mr. Nash presented Shawn and Carolyn Oliver with the Chairman’s Club Award which recognizes the top 25 membership-producing developer companies worldwide.